Composed by Various. Arranged by Gary Dahl. This edition: Paperback. Collection. Ethnic. Book. With Text Language: English. 48 pages. Published by Santorella Publications (SP.TS149). Germanic imagery is permanently ingrained in contemporary society. From the many tourist destinations modeled after quaint alpine villages to all the Bavarian-themed Oktoberfest; German folk culture has been embraced all over the world. One of the strongest components of this German culture is its music. The happy "oom-pah" of a village brass band is the musical calling card of any German festival. That music is inextricably linked to the accordion and German Favorites for Accordion published by Santorella Publications strives to present German music in all its Teutonic glory. 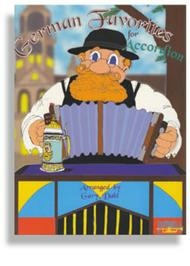 We'd like to invite each and every accordionist to hoist a stein of his or her favorite German lager and bring the best of Bierhalle home! The Water Nymph - Once a Rose a Lad Espied - O Joyous Time O Blissful Time - Let's Go Over - Then I Must Leave Thee - We Will Drink Another Drop - In Munich There Is a Beer Garden - Traveling Student - You Have Diamonds & Pearls - Lilli Marlene - O How Can I Leave Thee - Below in the Lowland - Joyful Life - Think My Loved One - Kissing Is No Sin. in my area, The book is well worth the money. Enjoyable intermediate level traditional German tunes. Recommended. 38 of 62 people found this review helpful.